​The members of The Order of the Cross are dedicated to living a life of compassion and follow a pacifist and vegan or vegetarian way of life. The Fellowship offers support and encouragement to all who would embrace its Aims and Ideals. The Order of the Cross was founded in 1904. The founder of this informal Fellowship, John Todd Ferrier, brought through a recovered Message of Love, Peace, Joy and Hope using the spoken and written word. The Teachings contained in the Message are universal in their scope, revealing the oneness of life and the unity of all religious aspirations. They show that many of the Christian teachings are mystical and allegorical in nature. Members have all been inspired by the writings of the Founder, John Todd Ferrier (see Quotations) and the main purpose of the Fellowship is to offer support and encouragement to all who would embrace its Aims and Ideals. Meditations, worship services and meetings where the writings of John Todd Ferrier are read and studied in an atmosphere conducive to spiritual aspiration and healing. As there is a very informal structure it is members who minister at meditations or worship services and who lead times for the study and greater understanding of the Teachings. These are usually in members’ homes in various locations in the United Kingdom, North America and Australasia. Similar activities are also organised periodically at gatherings, which are often residential and arranged to take place at retreat centres. The programmes include opportunities for Creativity (music, dance, photography, painting and creative writing) as well as informal fellowship. Families with children also attend some of these gatherings. Publication, sale and distribution of the literature that contains the Founder’s writings (referred to as the ‘Teachings’). There are many who live such a life with great integrity but do not seek membership, and they are always welcomed as a part of the global family of the Fellowship. Equally, those who have studied these Teachings, and wish to make an inner commitment to live in accordance with the way of life that they promote, may choose to become members of the Order of the Cross. The Cross of The Elohim represents the spiritual nature of our individual lives. 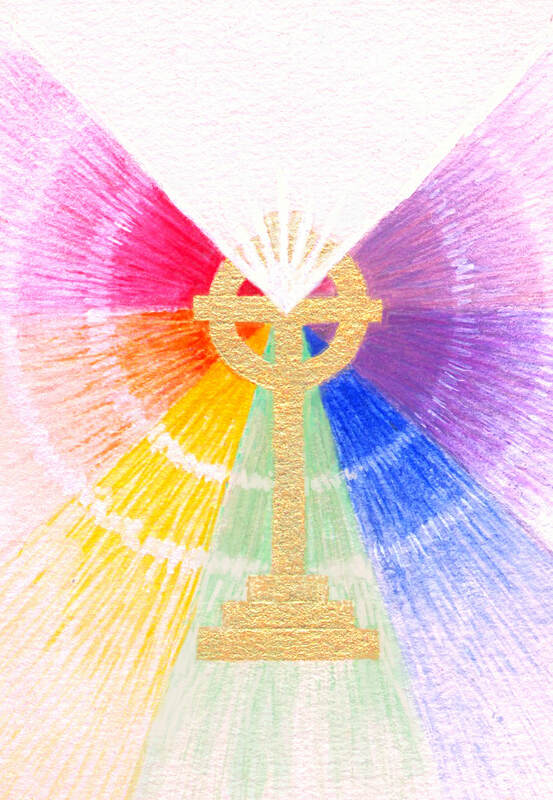 The seven colours represent aspects of love radiating from an upright and balanced life crowned by the white light of the Christ Life. ​The Cross of The Elohim represents the spiritual nature of our individual lives. Thus to endeavour by example and teaching to win all men to the love of Truth, Purity and Right-doing. 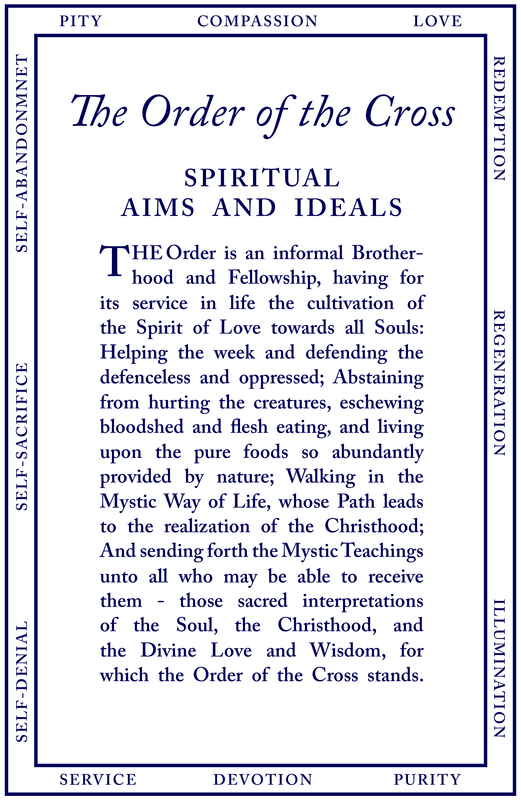 To proclaim the Brotherhood of Man, the essential oneness of all religious aspirations, and the unity of all living creatures in the Divine. To teach the moral necessity for humaneness towards all men and all creatures. To protest against, and to work for the abolition of, all national and social customs which violate the teachings of the Christ, especially such as involve bloodshed, the oppression of the weak and defenceless, the perpetuation of the brutal mind, and the infliction of cruelty upon animals, viz. : war, vivisection, the slaughter of animals for food, fashion and sport, and kindred evils. To advocate the universal adoption of a bloodless diet, and the return to simple and natural foods. To proclaim a message of peace and happiness, health and purity, spirituality and Divine Love.